Hmmm. Am I surprised a local tax addict would object? No. Around here, just about the only possible justification for his useless "tax"-financed "job" hinges on Prohibition*- of one sort or another. Yes, this is also a "dry" county. So, of course he believes (not "thinks") legalization would be "a mistake". He would probably be out of a paycheck and be forced to find honest work or spend more time fishing. I see he's worried about "impaired driving"- like it doesn't happen regardless. But, wait... what about the studies and tests which have shown driving under the influence of marijuana actually decreases the risk of being in an accident? I know, that's not helpful to the anti-drug bigots' narrative, so it's ignored. And when have I ever said that someone who harms another or their private property should be excused? What does it matter "why" they caused the accident? It doesn't. 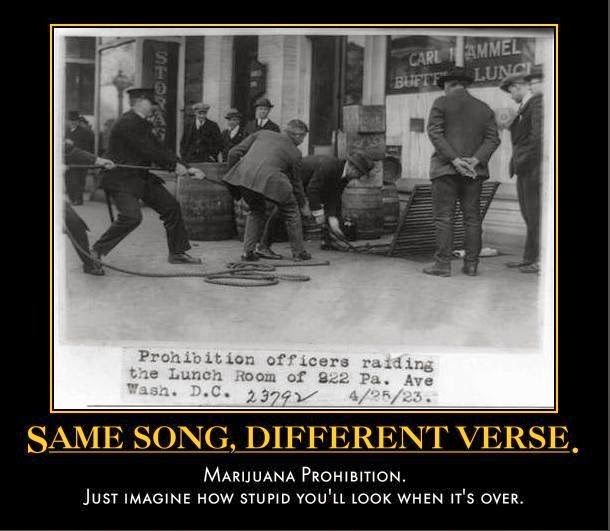 But it would "increase the difficulty of law enforcement to determine who is impaired"! Whine, whine! Yeah, lets keep violating people for your lazy, thuggish convenience! Here's a hint: If you can't tell if someone is "impaired", they aren't. Leave it at that. Next, he complains how difficult it would be to figure out if the Cannabis was obtained through "legal or non-legal channels". Idiot. That's like saying slavery shouldn't have been abolished because then it would be too hard for slave hunters to figure out if the person had been "freed legally" or had been a runaway. When what you are doing is wrong, you need to stop doing it; don't figure out how to keep doing it anyway. "Officers would need education concerning the enforcement of legal sales." No, they wouldn't. This is just more statist propaganda aimed at making liberty look "too hard". Just assume liberty and move along without molesting people. It's really pretty easy. Same thing with all his excuses about needing more enforcers and bigger budgets if there were fewer "crimes" to feed his lust. It is ALL statist** BS and lies. Read the whole thing. He just drones on and on, coming up with more unthinking statist justifications for continuing to follow his path of evil. But, don't worry- he says it's not going to happen in Texas (or especially locally) because people here are "more conservative". Conservatives are partly right- there are some things worth conserving. But this isn't one of them. Being wrong- advocating evil- is not worth "conserving", and staying "conservative" on this issue isn't something to be proud of. They should instead be ashamed. When you are going the wrong way, it's smart to stop and turn around, but I suppose "conservatives" such as the sheriff think it's OK to close your eyes and chant about why you have to stay the course as you head over the cliff. Not only are they going to look foolish in a few years, but they'll be seen as the force for evil they actually are. The blood of multitudes is on their hands over this ridiculous prohibition. **And I mean this is the worst possible way this time.